Adhyapak JIbanjit dutta memorial award has been started on 5th February 2018 at pragjyotis ITA machkhowa guwahati, in the fond memory of Late Adhyapak Jibanjit Dutta who has dedicated his life towards sattriya dance form till his last breath. On 1st February,1955 Jibanjit Dutta was born in Garamur Sattra, Majuli. Dutta received his training in Sattriya Dance and Drama under the able guidance of Sangeet Natak Academy Awardee, Adhyapak Roseswar Saikia Borbayan. Nrityacharyee Jatin Goswami of Guwahati, the acclaimed dancer also provided lessons to Jibanjit Dutta. 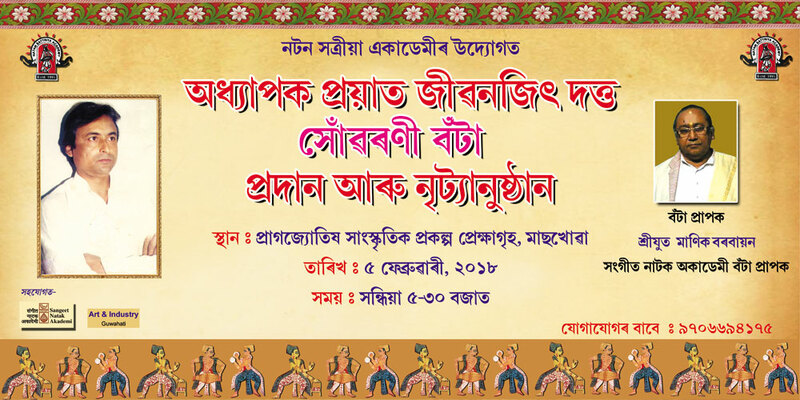 The 1st receiver of this award is Sangeet Natak Akademy awardee sri sri Manik Borbayan of Bhogpur Sattra from Majuli. Born in 1940 in Majuli island, Assam, Shri Manik Borbayan is a distinguished representative of the arts of dance and music nurtured in the Vaishnavite Sattras or monasteries of Assam. He received his training in the Sattriya tradition under Gurus Ratneswar Bayan, Debananda Borbayan, and Powal Chandra Atoi at the Bhogpur Sattra, Titabor, specializing in the Kamalabari style. Over the years, Shri Manik Borbayan has won renown as a performer and teacher of Sattriya dance, Ojapali, Khol and Borgeet. He has participated in dance and music festivals, seminars and workshops, both in Assam and other States including Nagaland, Manipur, Tamil Nadu and Kerala. He is also proficient in designing costumes for performance. He has imparted training in Sattriya dance and music to many young artists of Assam. Working with the mass media, he has performed and directed dance sequences in the Assamese film Kadam Tale Krishna Nache. Shri Manik Borbayan has received several honours for his work from institutions and State Governments in north-eastern India. The title of Borbayan was conferred on him by his own Bhogpur Sattra. He has also been felicitated by the Government of Manipur, the Haflong Namghar, the District Administration of Jorhat, and the Government of Assam.